Each year we look forward to highlighting the talent of designers in the hospitality field and supporting the education of future designers through the Durkan dscvr Student Design Competition. This year we are excited to showcase the stellar achievements of our 2018 grand prize winner, Brianne Brooks. In partnership with NEWH, a leading networking organization for hospitality industry professionals, we called for submissions of original and imaginative hospitality flooring concepts, and Brooks’ design, titled “Cosmo,” rocketed to top honors. Inspired by space exploration, Brooks focused on the drama of contrast between bright colorful nebulae and the dark void of deep space. 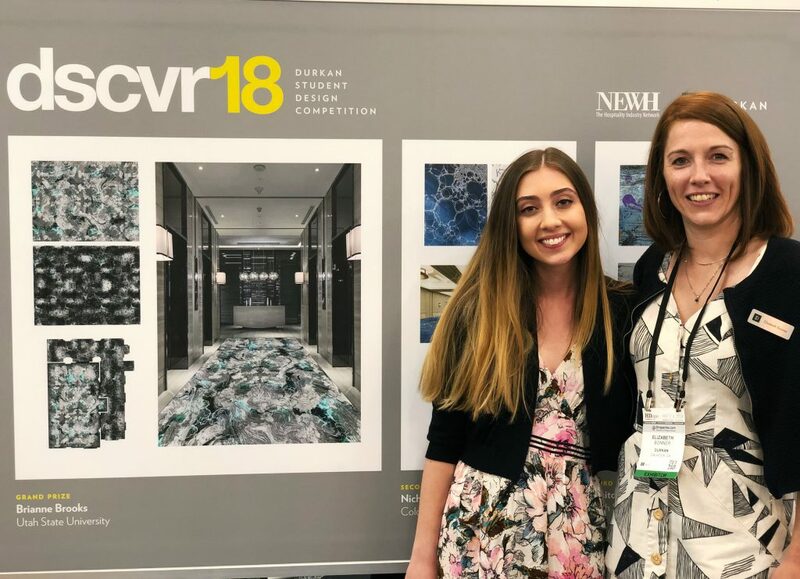 The Utah State University senior says she hadn’t envisioned flooring design as a career path until the dscvr competition. Brooks put her winnings to good use, applying the scholarship to pay for textbooks and other education expenses. In addition she was able to pursue LEED Green Associate certification and undertake an internship. Brooks plans to graduate in May with a degree in interior design and is now considering a career in hospitality design.